I thought I’d share these sweet corners of my daughter’s bedroom with you today. As the first room to be decorated in a hurry when I moved here, it’s now due to have a bit of work done on it – I had a roof leak practically as soon as I moved in, which meant that one of the walls in her room has never been quite right. I’m hoping to get it replastered soon so I can repaint it. All part of the never ending circle of house maintenance and redecoration! So in the meantime here are some snaps of these corners which I love – the wardrobe and mint green cupboard were both purchases from the Salvation Army which I sanded and painted (she has personalised the green cupboard by adding stickers which made me smile – children just love to add stickers to furniture!). 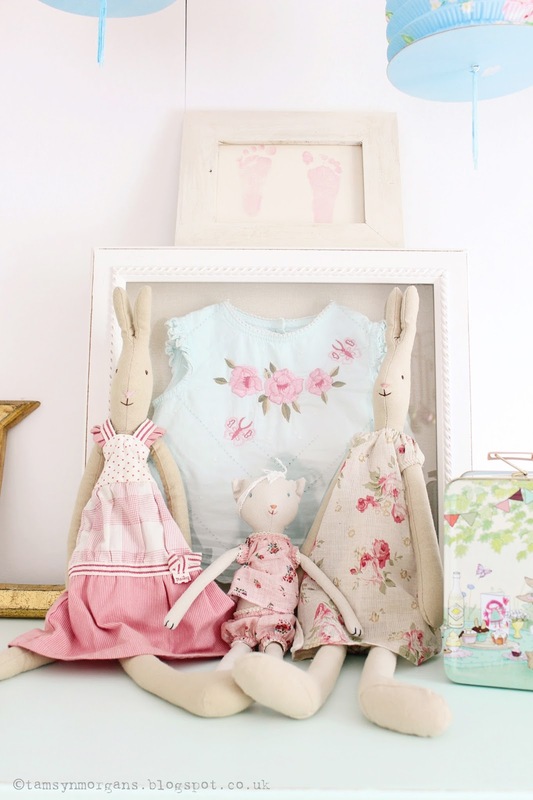 Maileg Bunnies are always a lovely addition to a little girl’s room, and I also framed one of her baby outfits in a box frame (you can get box frames from Hobbycraft). 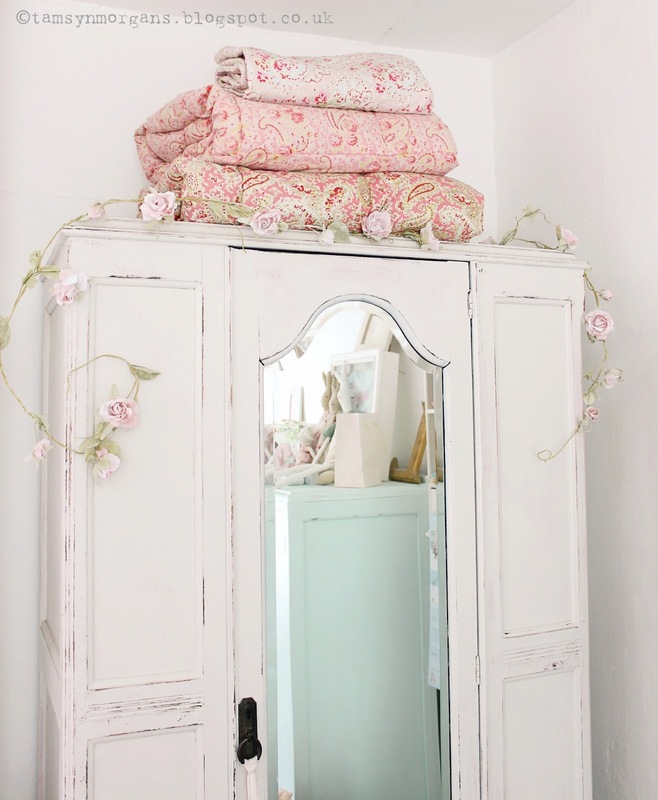 In a few years we will have to think about updating her room to something a little more grown up, so I’m making the most of these touches that link her back to her baby years – although I’m sure there will still be lots of floral vintage prettiness going on! 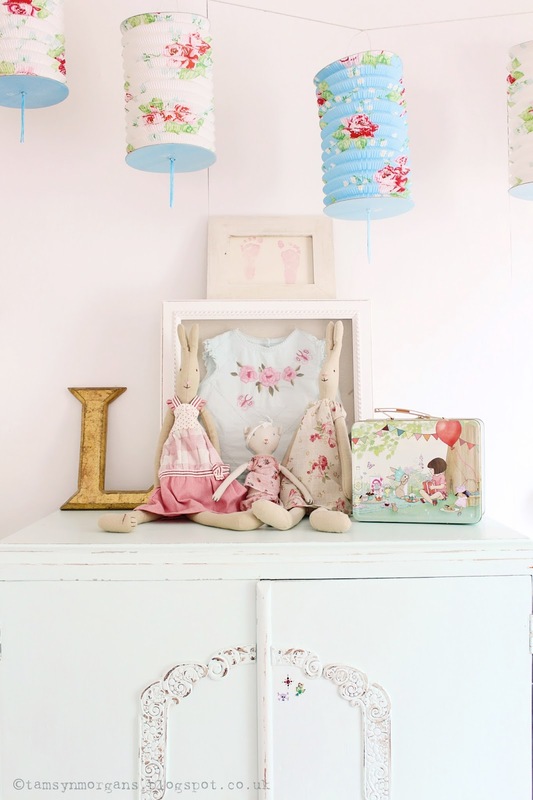 The paper lanterns are wonderful and the little lunch box : would you share the sources &/or link?